DOB: March 14, 2017 Five puppies (1 male and 4 females) all are black. Desi is the dam of our E2 litter. We are very excited about her two puppies, JJ and Evita, from this litter. They both have very outgoing and friendly personalities, wonderful temperaments and very good European breed type. Therefore, we decided to breed Desi again. As with her first litter, we wanted a male with excellent breed type, excellent temperament, and all health clearances. We have chosen Sammie as we have loved him for some time and he has everything we are looking for. He is the sire of the Black Gold F2 litter and we love what he has produced in this litter. Desi is very outgoing, an AKC Champion and needs 1 point for her Grand Championship. 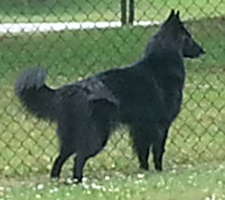 Sammie is a nice sized Groenendael male. He has is and AKC Champion and is working in agility. 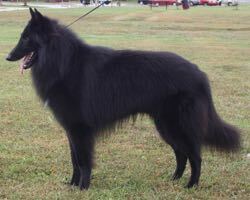 We are expecting all Groenendael in this litter with excellent breed type and outgoing temperaments. They should excel in both the show ring and in performance events. The breeding will take place the middle of January 2017 and we are taking reservations for show, performance and companion puppies. 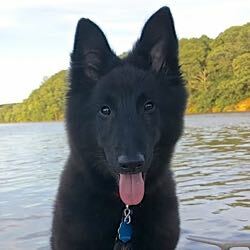 Each Black Gold litter is AKC registered, and each puppy comes with a health record and a guarantee for health and temperament. All puppies are vet checked before placement, temperament tested, structurally evaluated, microchipped, receive initial vaccinations, and are dewormed.